When I think of vintage objects, flea market finds, and antique materials, the first designer that comes to mind is Jenni Bowlin. Jenni is best known for her unique kit club and product line called Jenni Bowlin Studio but she has been involved in the industry for a long time. Her products are inspired by items from the past - from books, to bingo cards, bottle caps and so on. Everything she creates has a vintage edge to it but with a fresh interpretation. 1. I like the elegant patterns in the papers and the fact that they are not tied to a theme. 2. 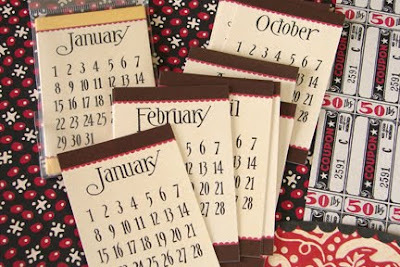 I really like how the products coordinate with older lines from Jenni Bowlin. 3. The new die-cut circle label mini papers are equally useful for cardmakers and scrapbookers - a great new addition to her line! 1. I'm a big fan of double-sided papers. All these papers are single-sided. 3. Umm...still trying to think of one! Although there isn't a specific theme in these papers, the rich reds and creams reminds me of Christmas so I decided to use them on a layout about putting up our Christmas lights. The colors of this line coordinate perfectly with the Core'dinations Core Impressions embossed cardstock. I created a collage of some of the papers and bingo cards and cut star shapes out of the collage to use as embellishments here. 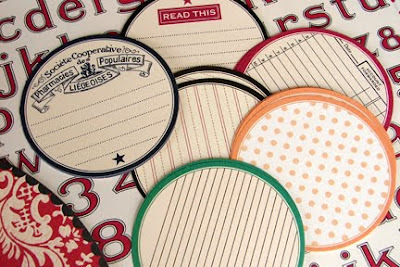 tiny circle alpha cardstock stickers and Sizzix star die. 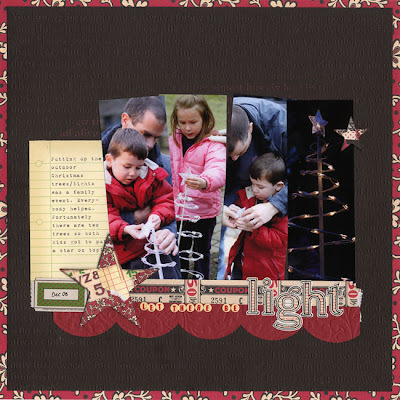 I also wanted to show how these sames papers could be used on a non-Christmas layout. This one about ice-cream is decidedly not-wintery! I used the older, but coordinating alphabet stickers and memo book for my title and journaling. 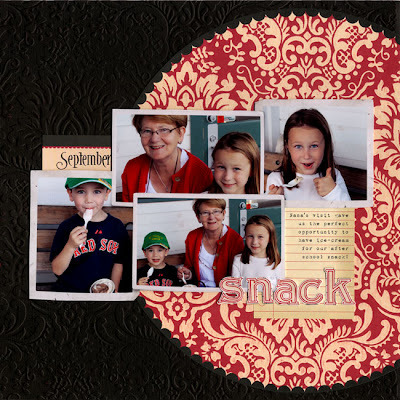 supplies: Core'dinations Core Impressions cardstock, Jenni Bowlin Studios die cut paper, memo book, calendar cards, cardstock alphabet stickers and digital cluster frame no. 25 by Katie Pertiet (www.designerdigitals.com). I mentioned how much I love the mini-papers for card-making. I needed a card quickly yesterday and whipped one up in 5 minutes using these papers! I always make 5.5x4.25 cards because I can get the envelopes easily. I also loved how the circle papers worked in my example here. I added an older Christmas bingo card to make this holiday card. 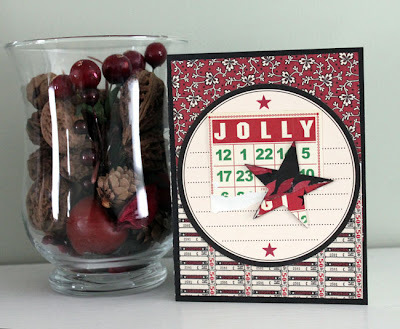 mini bingo cards - Christmas, mini die-cut circle label papers and Sizzix star die. 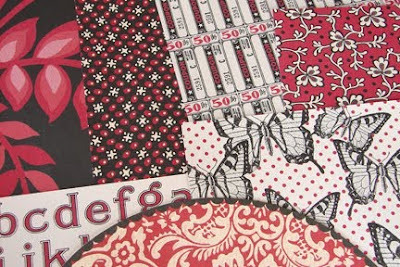 Are you a fan of Jenni Bowlin Studio papers and embellishments? What do you think of the Red and Black Extension II Collection? i'm definitely a fan! love the products and fantastic samples paula! I love this kit, the colors are Fantastic! I could see myself making many many things with this kit!! I have been a big fan of Jenni Bowlin for a while now. I especially love her embellishments - they are so versatile. I absolutely love Jenni Bowlin!! You are so right, all her lines coordinate well together, new and old! I love the Jenni Bowlin coredinations and her red and black products are beautiful!! Jenni Bowlin can do no wrong!!! I love everything she does!! I like the lighterweight paper because its great for layering. Love everything Red, so I've been a Bowlin fan for a while. Can't wait to get this new stuff. Great samples...thanks!! What is there not to love about Jenni Bowlin products. I have always been a huge fan and going from this kit she is yet to disappoint me with her product. YUMMMY!!! Great review!! Red/black/white is my absolute fav color combination!! I LOVE the small tight prints. I too am a fan of double sided paper/card stock...but when the patterns/colors are this great I can overlook that issue!! i think this extension is my favorite, she continues to impress me time after time. she's such a doll too. I am also a fan of Jenni. Love your projects. oh yes! i love JB stuff. and my boys hs colors are red/black, so her red and black collection is perfect and gets used a lot! i'm a big fan of "non-theme" papers, etc - love that she does this! I love Jenni! I am waiting for my latest order to arrive any day! another fan of JB stuff-love that she's not afraid to use bold colors-red is my favorite color and she's one of the only places I can find the perfect color of red without a Chritmas theme to it! Luscious and rich-I like it- a lot!! This is a great line. I love how you showed it would work for Christmas and everyday. I think my favorite is the circles. Your projects are gorgeous. Honestly, I don't know why this is, but I'm not too big a fan of double-sided papers. I feel like I'm somehow wasting the other side by using it. Weird right? I do like the lighter weight of her papers, mainly because I use a heavier piece of plain cardstock sometimes as the main background and the lighter papers don't make it too heavy in the album.